With the end of my University studies, it brings about a wind of change. While one door closes, another door opens. Finally escaping those shackles may see a new freedom, but it also brings with it a lot of responsibility. As I’ve always wanted to write, and my husband telling me that now is the time to do so, I’m not only feeling a bit lost, but also alone. I’ve never been good at change. When I was a kid I would get extremely nervous whenever I was placed in new situations. I would have great plans to undertake something different with my life, but then I would think about it for too long; weigh the pros and cons, and then abandon the idea altogether. I was afraid of doing something that was different with my life and as a result I would fail to make any real progress. Late last year saw a dramatic change in my life; my husband got a job in a town about 95 kilometres (59 miles) away from home. Rather than travel the distance every day, he decided to stay there during the week and come home for the weekends. I had not anticipated seeing myself as a single mother or weekend wife. This was going to be a real challenge; a change in my life that I didn’t dare think about, and yet, strangely that is exactly what got me through the whole ordeal during those early months. I refused to think about the situation and just got on with what needed to be done. There is an element of truth in Nike’s tagline of ‘Just Do It’; you just do what you have to do. I found the resolve to keep on going, and now over twelve months later in the same situation, I’m still using it. We’re stronger than we think we are. Being alone is not always a bad thing – in fact, it makes us more independent. If we’re not changing, we’re not growing. There’s no point in worrying, especially regarding those things that are out of our control. What we can control is our attitude and our approach, one day at a time. Are you afraid of change? Did you ever find yourself having to rely upon your inner strength? What situation have you been in that made you feel alone? Did you find yourself in a situation where you’re now glad you’ve gained your independence? Previous Post Lost & Found: A Writer’s Journey. Next Post One of Life’s Little Detours. 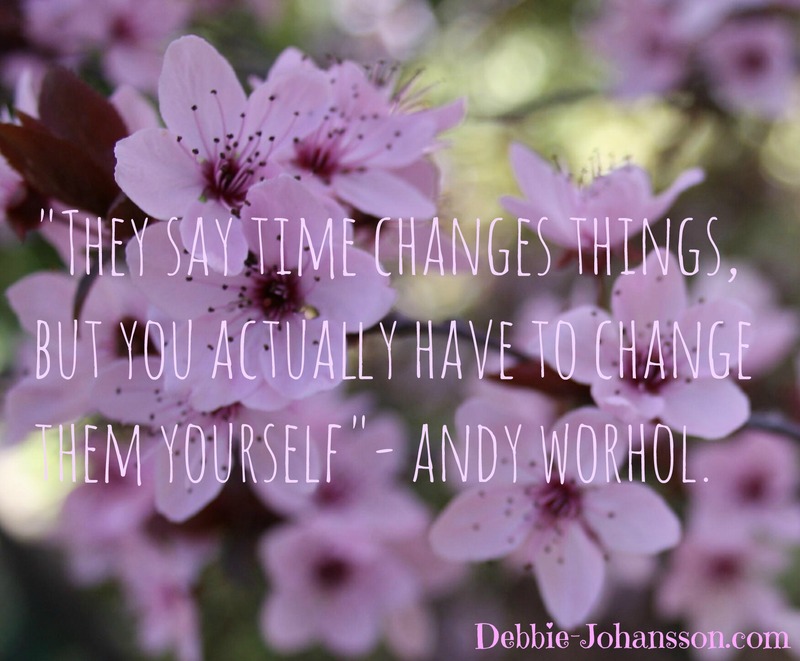 Debbie, your post struck a real cord with me – we all go through changes, some difficult, some not, but it’s how we approach those changes that determines how we grow as human beings. You coped fantastically with your hubby’s job change. Hopefully your weekend reunions are memorable! Debbie, I love this! Well done! Independence is a wonderful thing. Like you said, it brings out strength we never knew we had. You’ve done this ‘and’ finished your university studies. “Woot!” Here’s wishing you a long, well deserved weekend with family.